Everyone loves BBQ chicken, right? It’s definitely a classic meal at picnics and family gatherings. Most of the time, we enjoy our BBQ chicken from the grill. But this recipe involves cooking the chicken and sauce in a skillet. I gotta say, I still prefer the grilled version, but this is still delicious! It’s also great for people who might not have an outdoor grill but still want to enjoy BBQ chicken! This meal is quick, easy, and it’s healthy! You can’t ask for more! Down here in the South, barbecue is a big deal. Those of us born in one of the Deep South have an innate knowledge and appreciation for all things barbecued. There are dozens of types of BBQ sauce and cooking methods, and everybody has ones they prefer over others. I prefer the dark, thick sauces to the red, thin kind. And although Alabama is credited with first creating white sauce, I’m not crazy about it. Give me the sweet, molasses -ey sauce any day. The sauce for this recipe is unique because it actually uses blackberry preserves! It is very sweet, which is just the way I like it. Next time, I think I might add a little cornstarch to it to make it thicker, but my husband said he loved it just the way it was. Heat oil in a medium skillet over medium heat. Add chicken and cook 6 minutes on each side. Combine remaining ingredients, and pour over chicken. Bring to a boil,reduce heat, and simmer 5 minutes more, or until chicken is done and sauce has thickened. I also like the dark, thick BBQ sauces. Nothing beats a great BBQ. I cannot wait to start grilling again!! I agree Bernice! Grilling is one of my favorite things about warmer weather! I agree! 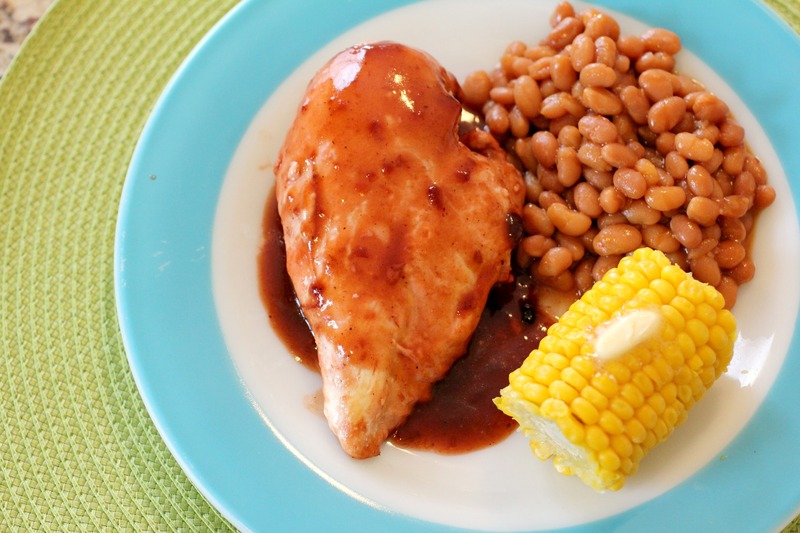 I’m from Texas and also love the sweeter BBQ sauces Those thin, vinegar based sauces just don’t cut it for my family BBQ Chicken looks delish! As a Texan, I know you can appreciate good quality BBQ! Thanks Sean! It’s made even better by the fact that it’s so simple to make! Aww thank you so much Linda! You are too sweet Hope you like the recipe! No problem! If you want to see more weight watchers recipes, you can click on the “category” box to the right of the page and click on weight watchers There are lots of them! This was soooooo good. But we had variations: 1) Didn’t have breasts, so we used thighs, with the bones still in place. 2) didn’t have blackberry preserves, so we used strawberry jam. My family loved it and said not to lose the recipe! Thanks, Lindsay!